In 1-quart saucepan, heat cheese product, Cheddar cheese, milk and taco seasoning mix over medium-low heat, stirring frequently, until cheeses are melted and mixture is smooth. Meanwhile, arrange chips on large serving platter. Pour warm cheese mixture over chips. Top with tomatoes and cilantro. Serve immediately. For a fun presentation, vary the color of tortilla chips you use. Choose among red, green white, yellow and blue tortilla chips. For most of us, football is a weekend ritual. As I mentioned in my pigskin post on Game Day Dips, I'm a football-loving girl. And I love the combo of football, friends and food. The games are always more fun when you're crowded around the television, together with your friends. Whether you actually watch the game or you prefer to just socialize - it's fun to do it up a bit. When it's your turn to host the gang, decorate your digs in a football theme. My table decoration received lots of compliments – it was a football field! To make it, head to your local home improvement store and ask for Astro Turf. It’ll be in the flooring section. I guarantee, most folks are using it for football season party décor, than for actual flooring. (Or at least, let’s hope so). But who’s judging? Cut the Astro Turf to the size of your table. Take the turf outside and spray paint white lines at each end for the end zones. Add any other football field graphics, such as additional lines, team logos, etc. I used mason jars to hold my party favors, cocktails and a fun take-home gift. I assembled an "in-a-jar" gift. That’s where you layer dry ingredients in a jar and attach the recipe for your guests to take home and complete. To pay homage to Miami University and its proud Ohio roots, I found this Three-Bean Soup recipe from Midwest Living. Layer the beans, tie the recipe on with a ribbon and position your football playing jars on the turf. Another fun party element were colored drink stirrers. Cluster together pieces of ribbon to resemble cheerleading pom-poms. This DIY is über-easy to make; frankly, it’s a touchdown! Simply cut pieces of ribbon the same length, twist in the middle and fasten with glue. Then stick to a colorful straw or stirrer for an instant drink pick me up, It'll have your guests cheering! What's the main ingredient at a football gathering? (Okay, besides beer.) It's the FOOD! Thankfully, Tablespoon has a multitude of recipes for cocktails and game day food galore! Snacks that can be grabbed by the handful are always a hit. You gotta try The Big Game Chex Mix. It's a honey mustard spin on the traditional recipe. Score! Chips, salsas, guacamole... all good! However, nachos are a staple of game day. 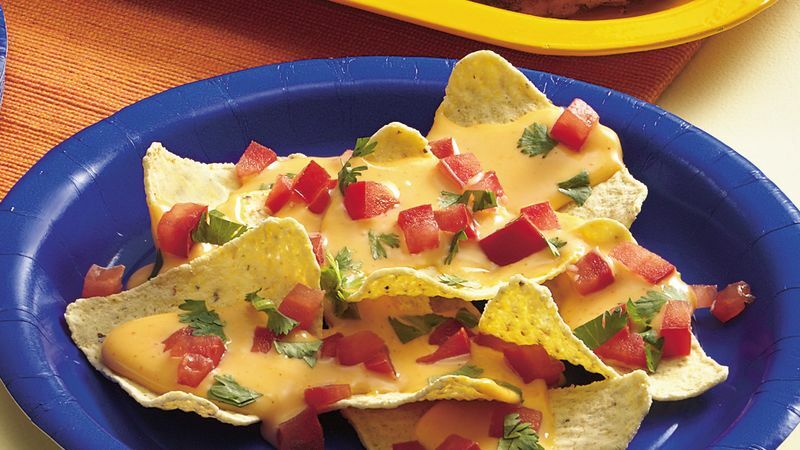 Game-Time Nachos are perfect to eat while watching football. Plus, if you need to make more during the game, you can whip them together in less time than it takes most refs to determine a challenge. Add a little touchdown dance to the party with Jelly Shots. You can make almost any classic cocktail recipe into a jelly shot. Definitely use colors that complement your team! Whip them up for just the adults (read...boozy) or for the whole family (omit the alcohol). No matter who you are rooting for, your gathering will be a winner when you incorporate some of these fun tips! Happy football season to all! Now that you have the party started, check out these other game day recipes!